A dandelion killer may contain conventional herbicides or organic ingredients, but it does need to be strong, since dandelions are tough to eradicate completely. Their toothed leaves and telltale yellow flowers sprinkled through the lawn may look nice to some but to others, they're a pest waiting to be eradicated. There are many dandelion killers on the market. Most contain strong herbicides and should be used only as a last resort. The University of California at Davis suggests hand-removing solo dandelions before they spread. You'll need to dig down deep into the soil, since dandelions have a long taproot. If you just rip off or kill the top portion of the plant, the taproot continues to send forth new greens. The only way to kill dandelions completely is to kill the plant and the taproot. 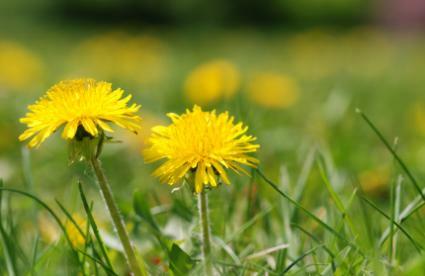 Many of the herbicides used to kill dandelions can also damage the lawn. It's important to carefully read all dandelion killer ingredients and directions and follow them to the letter. Commercial sprays and turf grass conditioners, such as the ones made by the Scotts company, often contain these chemicals along with others to control a broad range of weeds in the lawn. If you're trying to remove weeds from flower beds or near orchard trees, check to be sure that sprays purchased as dandelion killers can be used near such plants. There are several all natural dandelion killers you can try at home. One is to simply pour boiling water over the dandelion. Be very careful when pouring the water to keep it from splashing back at you.A second organic dandelion killer is vinegar. Plain white vinegar, diluted with a little water and applied directly to dandelions, kills both plant and root. It acts as a desiccant forcing water out of the leaves and drying the plant up. Removing dandelions by hand is the safest method. Use a long, thin metal fork specifically for dandelion removal. It's a gardening tool with a wooden, rubber or plastic handle and a long metal barrel with a two prong fork at the end. This tool enables you to dig down deep and snag the dandelion by the root, removing root, plant and all.Another option is to deny the dandelions light by using landscape fabric around ornamental shrubs and flowers. Landscape fabric provides a light barrier but its permeable nature allows water to seep through to plant roots. While it can only be used on such areas as garden pathways and around shrubs, it offers a good way to control dandelions and many other types of weeds in those areas. While a dandelion killer can eradicate single plants, once you have dandelions in the lawn it's almost impossible to get rid of them all. By the time you see the telltale yellow flowers, the plant is almost ready to set seed, and each puffy seed head distributes hundreds of seeds on the wind. These can easily spread dandelions a good distance from the source. Lawn care experts recommend frequently mowing, which cuts down the dandelion heads before they can sprinkle seeds and multiply. Letting the grass clippings mulch back into the lawn may smother emerging seedlings too. Over seed lawn areas so that the turf grows so thick that dandelions cannot take root. Dandelions are actually quite benign and even helpful in the garden. Although you may want a dandelion killed right away, consider this: dandelions aerate the soil and transform minerals into a usable form that when the plant dies, it puts back into the soil. The flowers also provide food for ladybugs, so-called 'good' garden bugs that eat aphids. And did you know that you can actually eat dandelions? The leaves provide nutrients in salads and can be brewed into medicinal teas.So before reaching for the dandelion killer, think about its impact on the ecosystem. If you're bound and determined, perhaps choosing boiling water or vinegar as a dandelion killer could make a smaller impact on the environment.